The first time I made this sandwich was for my sister-in-law’s first baby shower. It is from one of my favorite tea books Tea-Time at the Inn by Gail Greco, a book loaded with great recipes from tearooms across the U.S. representing a wide variety of styles and cultural influences. This particular recipe is from The Inn at Perry Cabin in St. Michaels, Maryland. Zucchini bread might seem like an odd choice for a savory sandwich, but the bread and crab compliment each other beautifully. They are both rich, both sweet–I don’t know, I’m not a taste bud, it just works. 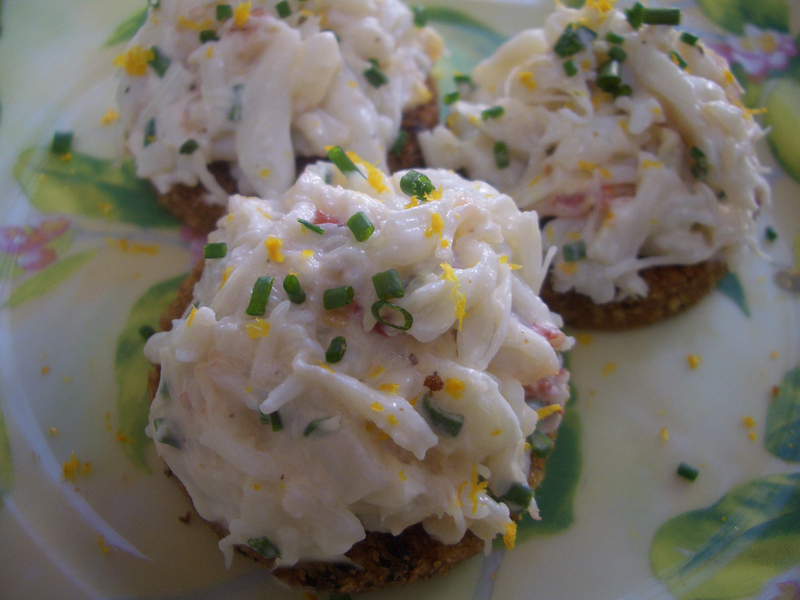 And the deep brown color of the bread is an attractive backdrop to the creamy white crab salad with its flecks of green from the chives. This is not a cheap sandwich. 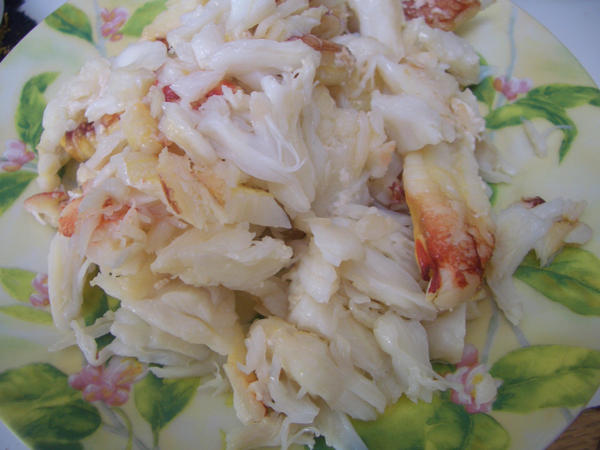 If you want to cut costs, you can make it with canned crab, just try to avoid those containing MSG. If you can afford to splurge a little, treat yourself and good friends to fresh crab. 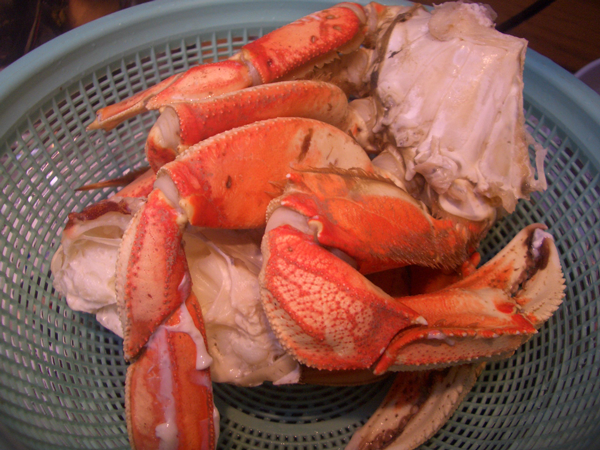 We are in the middle of Dungeness crab season here in SF so I cooked and shelled the crab and, well, it was fabulous. Maybe serve these with a tossed green salad and swap the tea for a crisp white wine… If serving tea I would serve a light green tea; a strong fermented tea might overpower the delicate flavor of the crab. If you want to save a little time, use store-bought zucchini bread. You can split the recipe in two if you’re having a small party. One crab will make enough salad for 12 small sandwiches. 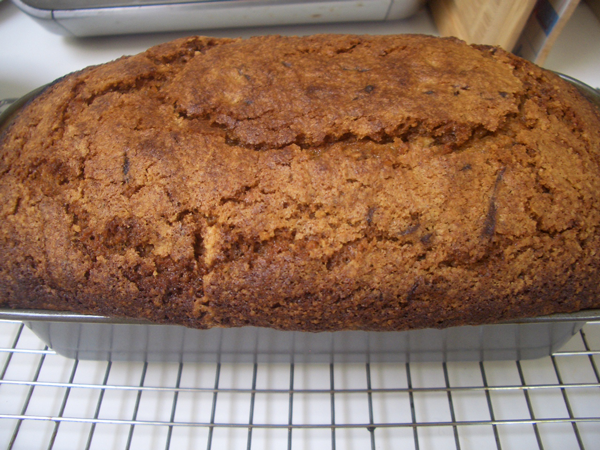 Make the zucchini bread as two loaves, and freeze one for later. I have the fish guy clean the crab for me. I know that’s half the fun for some, but it doesn’t ring my bell. For instructions on how to do it all, go here. 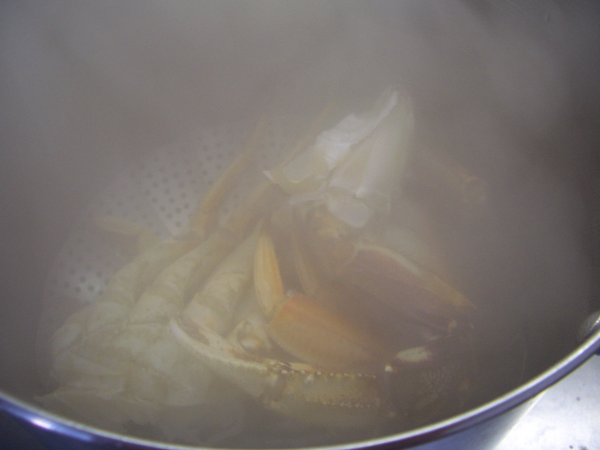 Bring an inch of water and 1 tablespoon kosher salt to boil in a stock pot fitted with a steamer basket. Add the crab and cover, and cook for 15 minutes. 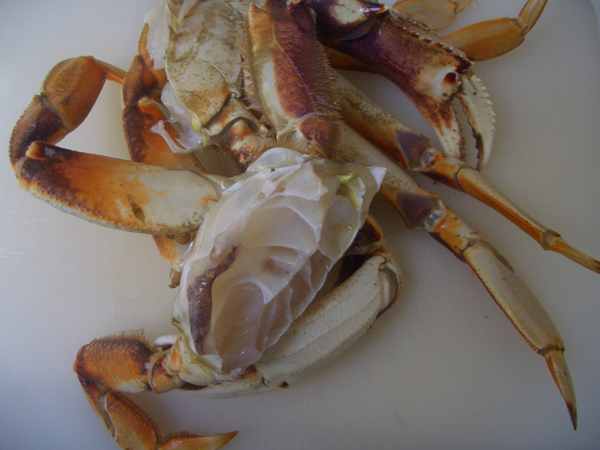 Using either a mallet, nut cracker or shellfish cracker, remove the crab from the shells. You will need some tool to get it all–you’ve paid good money for this, don’t be delicate, get in there. 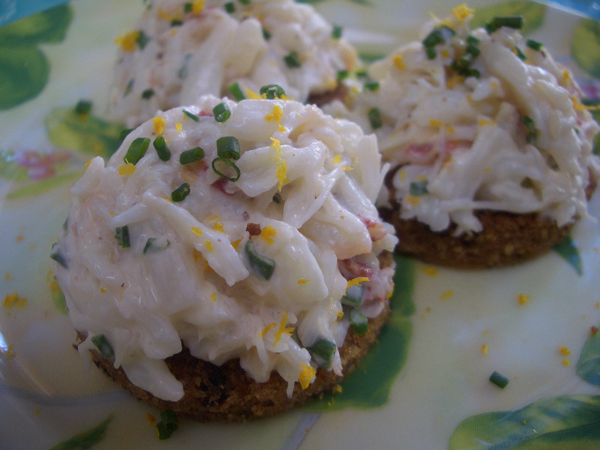 Combine the crab, crème fraîche or mayo, chives and lemon juice. Taste and season with salt and pepper only if needed. Cover and chill until you are ready to assemble the sandwiches. Preheat oven to 350 F (175 C) degrees. 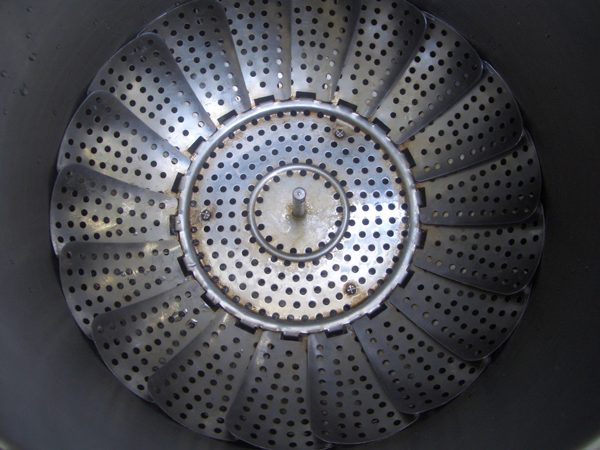 Grease either one or two 9 x 5 inch (23 x 13 cm) bread pans. Grease them well, including the rims. Using a stand mixer, handheld mixer or whisk, beat the eggs until frothy. Add the oil, sugar, and shredded zucchini. Sift or whisk the flour, baking powder and soda, salt, and cinnamon together. Add to the zucchini mixture, and mix well. Stir in the toasted chopped nuts. Pour the batter into the pan(s) and bake for 1 to 1-1/2 hours. If you’re making one big loaf, it might take a while until it’s done. Check the bread at the 40 minute mark, and if it’s getting too brown on top, cover it with aluminum foil. It’s done when a toothpick inserted into the middle comes out clean. The smaller loaves will probably only take about 40 minutes. Why so much variation? Once cool, cut the bread into thin slices. Either cut the slices into rounds and top with a tablespoon or so of the filling, or put the filling between two slices of bread, trim the crust and cut into rectangles or triangles. The reason I like the rounds is they show off the crab and the bread is sweet and rich, which is better as a background player. Sprinkle with lemon zest and chives. Serve immediately, or cover with a damp paper towel and store in an airtight container. The sandwiches are best when eaten the same day they’re made, simply because seafood, unlike other filling ingredients, starts to get a bit fishy when it sits around.